Without raw materials, the factory shuts down and the Once-ler’s relatives leave. The Lorax says nothing but with one sad backward glance lifts himself into the air “by the seat of his pants” and disappears behind the smoggy clouds. Where he last stood is a small monument engraved with a single word: “UNLESS”. The Once-ler ponders the message for years, in solitude and self-imposed exile. In the present, his buildings falling apart around him, the Once-ler at last realizes out loud what the Lorax meant: “Unless someone like you cares a whole awful lot, nothing is going to get better. It’s not.” He then gives the boy the last Truffula seed and urges him to grow a forest from it, saying that, if the trees can be protected from logging, then the Lorax and all of his friends may come back. Dr. Seuss, too, was peeved as, according to the New York Times article, he was upset that a development project in San Diego proposed to cut down the eucalyptus trees around his home. Seuss (real name: Theodore Geisel) wanted to write a children’s book about environmentalism, but got writer’s block, so his wife suggested they chill out at the Mount Kenya Safari Club, a fancy resort with plenty of animals and forest around. That lifted the block, and Seuss wrote most of The Lorax, a perennially popular book (over a million copies sold in 15 languages) in just one afternoon. (From the paper): a, Location of the Mount Kenya Safari Club together with data on the patchy distribution of patas monkeys (E. patas) in Kenya. A comparison of historical records (pre-1996) and surveys between 1996 and 2004 indicates that the range of E. patas has declined by 46% in Kenya24. b, The Lorax in the crown of a silk-tufted Truffula tree. c, Spindly tree that resembles the whistling thorn acacia (A. drepanolobium). d, Male patas monkey; the subspecies in Kenya (E. patas pyrrhonotus) is distinguished by its black facial skin and white nose25. e, Female patas monkey feeding on A. drepanolobium. 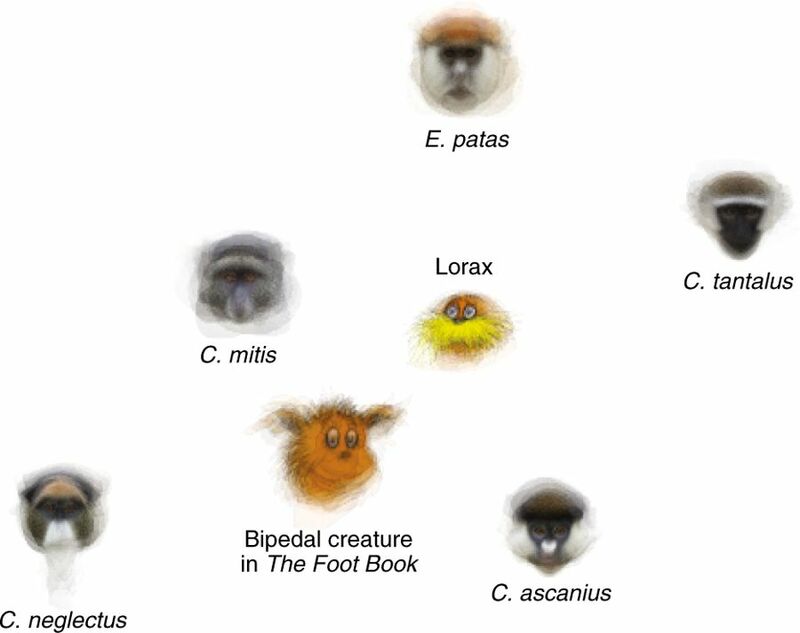 (From the paper’s Figure 3): We used a characterized camera19 to photograph every forward-facing image of two Seussian creatures, the Lorax (n = 13) and the bipedal creature in The Foot Book (n = 13). We calculated the mean face of each creature19 and projected it into a space containing the faces of every cercopithecine monkey in Kenya: the patas monkey; the tantalus monkey (Chlorocebus tantalus); the red-tailed monkey (Cercopithecus ascanius); the blue monkey (Cercopithecus mitis); and the De Brazza’s monkey (Cercopithecus neglectus). We used eigenface decomposition methods to calculate facial similarities19 and we generated the plot with t-distributed stochastic neighbor embedding (t-SNE)26, an iterative algorithm that down-projects multidimensional information into two dimensions for visualization. Dates, physical similarities and probable encounters underlie our proposal that patas monkeys inspired the Lorax. His physical appearance postdates Geisel’s trip to Kenya, evolving into a short, “sort of man” with a signature moustache; his mossy pelage was blue before it was orange (Fig. 2). Many of these final traits are shared with patas monkeys and it is probable that Geisel encountered them at the Mount Kenya Safari Club (Fig. 1a). Even the voice of the Lorax (a “sawdusty sneeze”) resembles the ‘whoo-wherr’ vocalization of patas monkeys; the ‘whoo’ is a loud, wheezing expiration of air. It appears to be an alarm call issued in response to predators and human observers. From this the author’s conclude that “Geisel drew inspiration from a ceropithecine monkey and its ecology” when writing The Lorax in Kenya. That’s possible, although the Lorax is most facially similar to the blue monkey, which is neither blue nor commensal with the acacia, but has a wider diet. If that’s the case, then the similarity between the Truffula tree and the whistling thorn acacia falls apart. The hypothesis is semi-interesting, but there’s no way to test it given the lack of verification from Seuss, and I’m not convinced by the author’s arguments that the lorax is really based on the patas monkey. If this natural commensalism [between acacia and patas monkey] informs The Lorax, it challenges traditional interpretations of the Lorax as an ecopoliceman asserting his authority. If the Lorax is based on the patas monkey, he can be seen as a sustainable consumer dispossessed of his commensal partner and an equal victim of environmental degradation. Well, yes, all this is as possible as anything else. And the authors do point out that this commensalism is endangered, as the acacia is being heavily browsed by giraffes, rhinos and elephants, and that, combined with its use as charcoal, is bringing the tree toward extinction. Likewise, the range of the patas monkey is said to have “collapsed” recently, so Seuss’s lesson, even if not drawn from this system, still applies: stop destroying ecosystems by removing an important element. Granted, this short (three-page) paper is in the “books and arts” section of the journal, and it’s a semi-fun read, but to me doesn’t make a convincing case. And I’m not sure why Joanna Klein wrote a longish piece about the paper for The New York Times. The source of the lorax remains, at least to me, a mystery. Whether an eco-policeman or part of an endangered ecosystem, the Lorax has brought joy to children for fifty years. This entry was written by whyevolutionistrue and posted on July 25, 2018 at 10:45 am and filed under books, conservation, ecology, primates. Bookmark the permalink. Follow any comments here with the RSS feed for this post. Both comments and trackbacks are currently closed. Mebbe but the Lorax looks more like Wilfred Brimley to me. The Lorax says nothing but with one sad backward glance lifts himself into the air “by the seat of his pants” and disappears behind the smoggy clouds. From that description it sounds like the legendary weejy-weejy bird, said to have but one wing, causing it to fly in ever-tightening circles, until it eventually disappears up its own fundament. Do you know the “Dahu”? It’s a kind of mountain goat characterized by two shorter limbs on one side of the body (either the two left ones or the two right). This help them to walk around mountainous slopes but only in one direction (either clockwise or anti-clockwise). Note that the video title translates: “Documentary on the dahu | Imaginary beast”. That is a brilliant documentary though I’m not sure why they used a digitalized version of Jonathan Winters in place of the real hunter/keeper. I read some sites sometimes devoted to various forms of fiction. Trying to figure out what an author “had in mind” is a common, if futile, activity. Especially when the author is dead. La mort de l’auteur, as Mssr. Barthes put it. I think sussing out the author’s intent has been moribund as a matter of lit-crit since the New Criticism and Reader-Response schools in the middle of the last century. Well, people (Derrida) went too far the *other* way, and also applied it to non-fiction, where it is even dicier. The whole argument seems very weak. However, I had read some time ago that many of the trees that populate other books by Seuss are based on the eucalyptus trees that are common in San Diego. I don’t know where that idea comes from, but to me the suggestion seems reasonable. I love eucalyptus trees here in San Diego. Most of them are being taken down because their roots are short. So I’ve heard, but I’m not a tree specialist. Last storm, 4 houses in my neighborhood had these huge eucalyptus trees fall on their garages or the street in front of their homes. Luckily, no one was hurt. I went for a walk after it happened and was climbing over logs to walk up the street. I was told insurance companies won’t pay for the damage anymore, if they fall. So people are taking them out. The tree that fell on one neighbors garage, has a house full of rescued cats and dogs. I was glad the tree fell in the garage direction of the house, instead of the house direction. All did fine, but they said they thought it was an earthquake when the tree fell while they were sleeping. I’m sad to see them go, but if I had one, I would have it removed. We have protected beautiful Torrey Pine trees though! Lived in S.D. for several years. Wait a minute.. *Sigh*. Ok, if I understand correctly they are not native to the area anyway, and the lovely scented bark and leaves that they shed all over the ground actively kills surrounding plants. So I have mixed feelings about their removal. Yes. Eucalyptus are non-native in California. The shredding bark makes great fuel for fires. Native decomposers can’t break down the dead leaves, branches, etc. Few insects eat the trees, so they provide little food for birds, etc. And birds who do feed on them can have their beaks glued shut by the sap. Eucalyptus can be lovely, but they aren’t good trees for California. The Guardian put this story in the science section. Eucalyptus trees (aka blue or red ‘Gum trees’) are kinda invasive here: nothing else grows underneath them. Only Koalas love them. Apparently they – the Gum trees, not the Koalas- release toxins that kills other plants (I’m not sure this is correct, it is just ‘popular wisdom’), but there is indeed little growing underneath a gum tree. I love the idea that the Lorax was based on Patas or Blue monkeys and the whistling thorn acacia, it may even be true, but we have no way (as our host points out) to verify. I don’t buy the similarities between the trees. 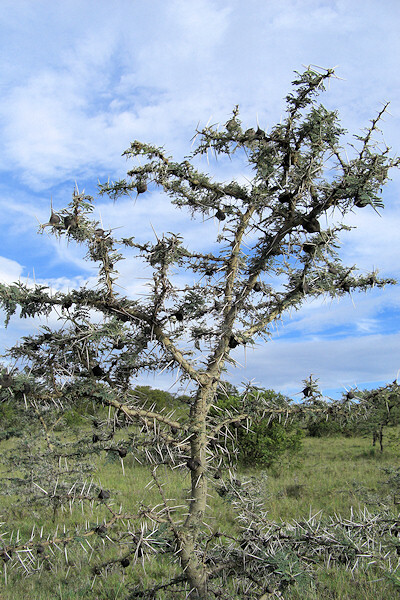 In the photos I’ve seen, acacia trees have multiple branches, for example–while truffula trees have only the stem and the puff at the top. The search for The One True ____ in science has historically caused far more harm than good. A far better question to ask is “What were the potential sources for X?” Sometimes there’s only one, but more often you find a far richer story. If you look for The One True ____, you’re forcing yourself to reject anything you don’t accept–whether the thing you’re rejecting is a significant contributor to the thing in question or not! If you look for the contributing factors, you can accept anything that’s true. Sometimes reading the comments here is like visiting the nit-picker’s brigade! – The Lorax is an excellent way of getting the message across – that we have to look after the environment – it’s funny, serious and educational all at once. It’s a gem. We insist that our students and volunteers watch it when they are here. Whether the message sticks, is another matter – our urbanized culture isn’t helping. Bye-the-way – Eucalyptus trees in general are allelopathic – that is they release compounds which inhibit the germination of unrelated species – in Oz – the unrelated species have co-evolved with the Eucalypts – so it isn’t that evident. The ubiquitous Pinus radiata in Oz – is highly allelopathic. First of all, your first sentence is inappropriate and rather insulting. Second, nobody is saying The Lorax doesn’t have a good message or isn’t a good book. This post, and the paper on which it’s based is about what the Lorax was based on. So it’s perfectly valid to take issue with the hypothesis of the paper. And the book would be just as valuable if the paper hadn’t been written. Your statement, “Now the book has been impugned for making The Lorax into a domineering and obnoxious sort of environmentalist (“ecopolice”),” kind of suggests that somebody is actually saying the Lorax doesn’t have a good message or isn’t a good book. Not necessarily you, of course! Lorax would be a good name for a pet. Especially a pet monkey. Badadada, I’ll be here all week folks. I’m highly skeptical. Both the Lorax and the truffala trees seem to me to be directly related to other Seuss cartoons far more than real plants and animals he observed in his environment. There’s nothing particularly new or unique about them compared to other Seuss drawings. The humming fish of the Lorax’s 1971 book could easily be the one fish two fish etc. fish from 1960. I like the Lorax as a book, and I liked Dr. Seuss for reading for my kid for years. But I don’t think there’s anything particularly new or remarkable about the visuals in it. It’s just more of the same Seuss. For a much better (though much smaller) potential model for the Truffula Trees, google images of Anemone occidentalis, or indeed fruits of any Pasque Flower. Slightly off-topic, but the movie is fairly entertaining (at least for the kids). In that, the Lorax is voiced by Danny DeVito, which stuck me as perfect casting. The Lorax is easily my favourite Dr. Seuss book. I enjoyed the 70’s cartoon based on it, but was annoyed that the recent movie basically fit the entire book into one song. Someone also missed the point of the book at Universal Studios, where their Lorax section is entirely hard plastic, including the ‘leaves’ of the Truffula trees.